Hi! 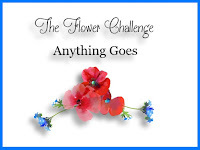 I'm thrilled to be guesting over at CAS on Friday blog where this challenge, the theme is flowers. Well, who doesn't like flowers? I created a little bouquet on my card using some SugarPea Designs floral images and dies. When I stamp images such as this, I always stamp and die-cut extras and leave them in the stamp packet for another time. This was one of those times. I grabbed some of the images and created a bouquet, using some Press 'n' Seal to hold everything together. A stitched panel was stamped with the sentiment from Kind Soul and then I adhered all the flowers and leaves to the bottom left corner. Once they were all stuck down, I adhered the panel to a scalloped edged piece of Peach Bellini - such a gorgeous color! The scalloped panel was adhered with foam tape to a white card base. 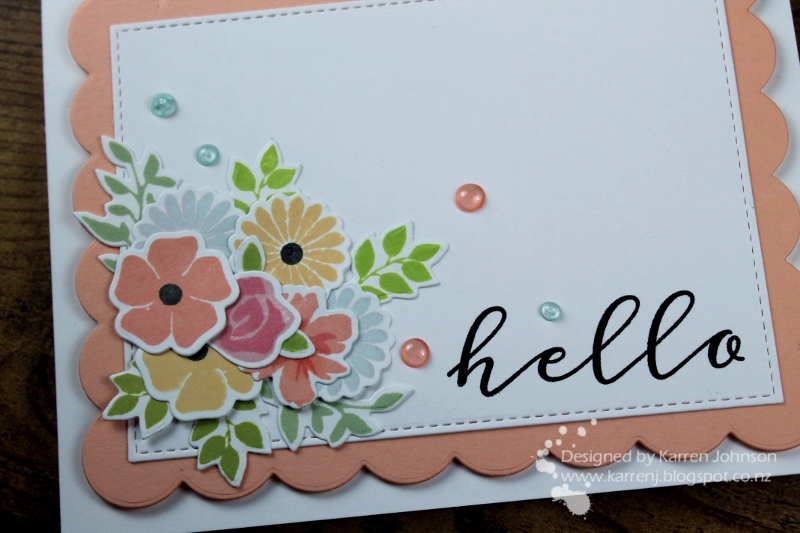 I finished with some Jewel Drops in colors to match the flowers and my card was done. 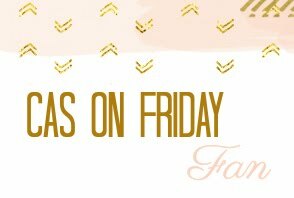 Thanks so much to the team at CAS on Friday for having me as their guest. Head on over and check out the challenge and the gorgeous cards made by the DT. 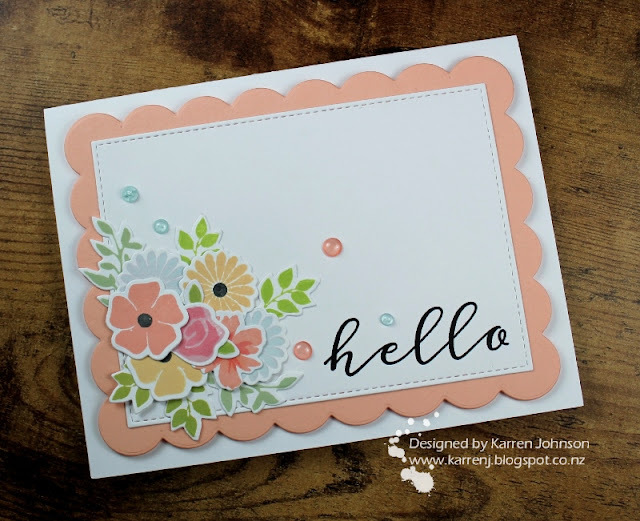 I'm also playing along in the SugarPea Designs Mix It Up Challenge where I was inspired by the coral-tones and greenery of the floral image. Edited to Add: This card got a shout out at SugarPea Designs. Hi! It's time for another challenge at Just Add Ink and this week our challenge is to Just Add 'A'. I went a rather obvious route with 'apples', but I also threw in some 'angled' panels as well to keep it interesting. I colored up this Power Poppy image during the last Daily Marker 30 Day Challenge and set it aside to use someday. 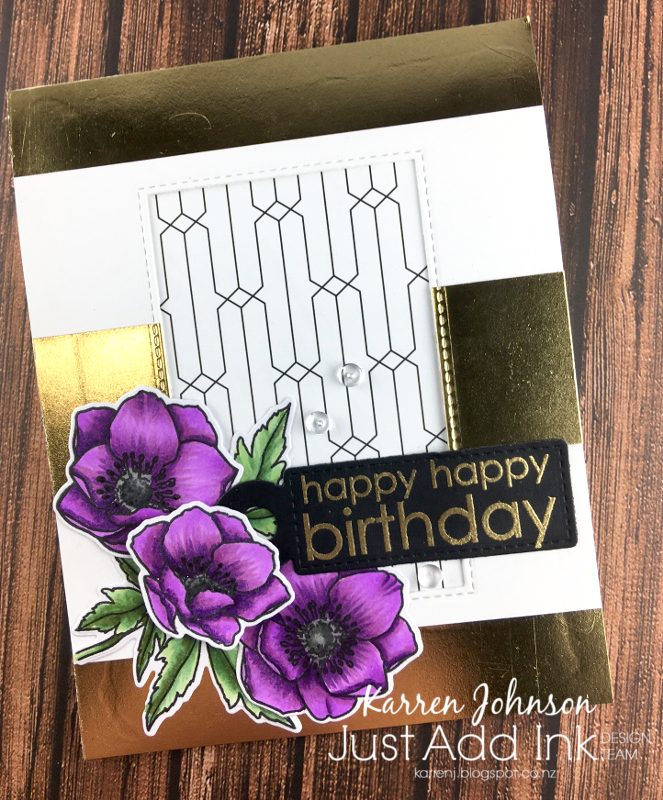 When I put together this card, I did some out of the box die-cutting with a stitched rectangle die and also used lots of patterned paper. 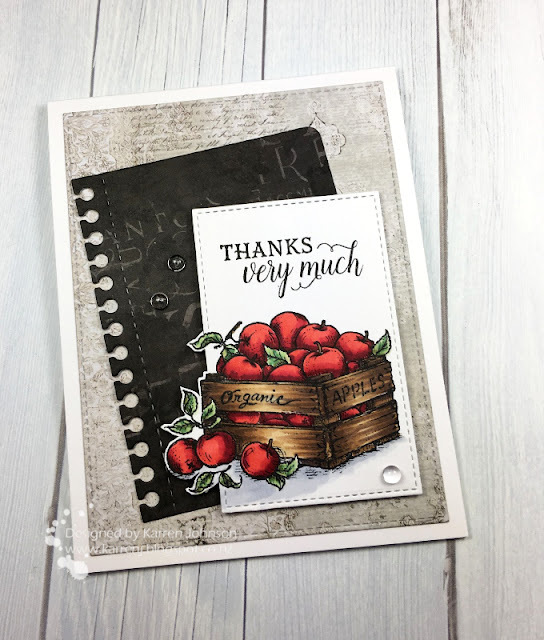 The notebook die is from SugarPea Designs and the stitched dies are from MFT. 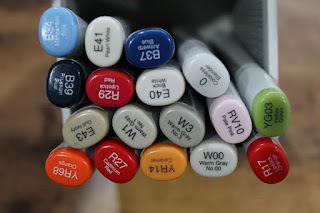 The image is Copic colored, although I don't have a photo of the markers I used as it was so long ago. I finished the card with some clear droplets. Thanks for visiting! Be sure to head on over to the Just Add Ink blog to see how the rest of the team added 'A' to their cards. Hi and welcome! 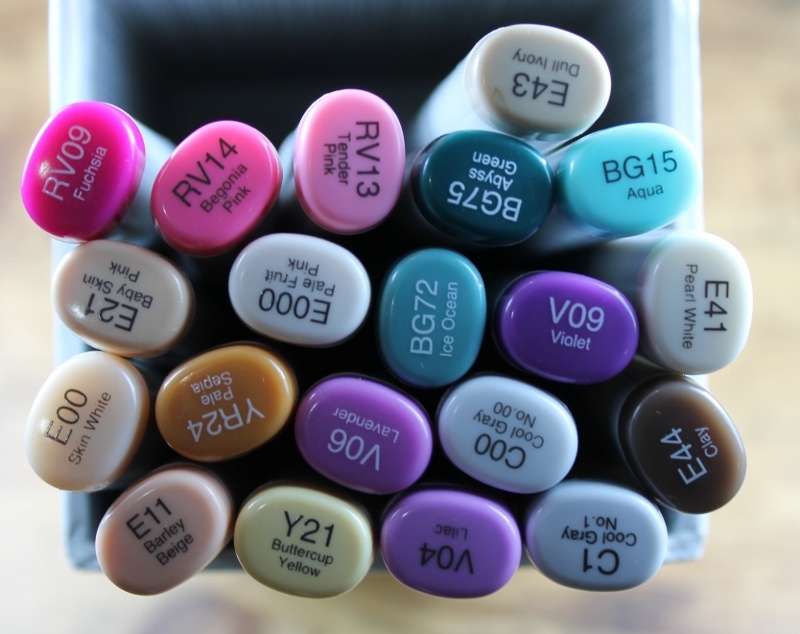 It's Freshly Made Sketch Challenge day and this week our hostess is the lovely Amy O'Neill. 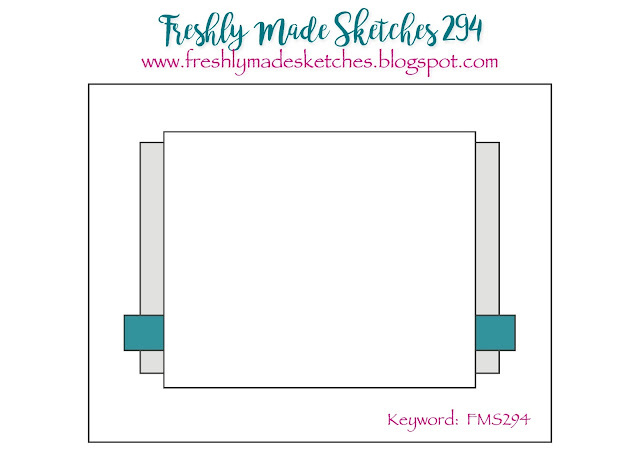 Amy's sketch is fabulous - perfect for creating a focal point in that big centre panel. 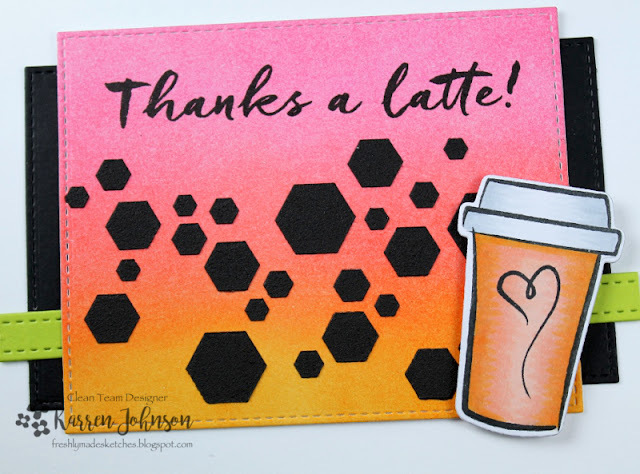 I wanted to play along with the Coffee Lovers Bloghop again before it closes so came up with a summery-colored coffee card. 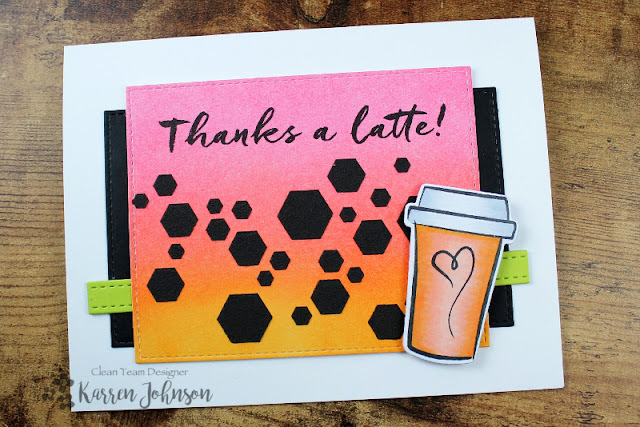 I was inspired by the colors and the hexagon shape at the Pinsights Challenge. On the centre panel, I blended distress inks onto a panel of Bristol Smooth cardstock before die-cutting it with a stitched die. I did have to do some partial die-cutting to get the panel deep enough but that was easy enough to do. Once that was done, I took some black embossing paste and a hexagon stencil and stenciled over the panel. I love the contrast of the bright colors with the black shapes and sentiment. The cup was colored with Copics and die-cut and the sentiment was stamped in Versafine Onyx Black. I used a black stitched frame and then a Limelight strip to add even more bright color! Thanks for visiting! The FMS DT have some gorgeous inspiration so head on over and check them out. Hi and welcome! 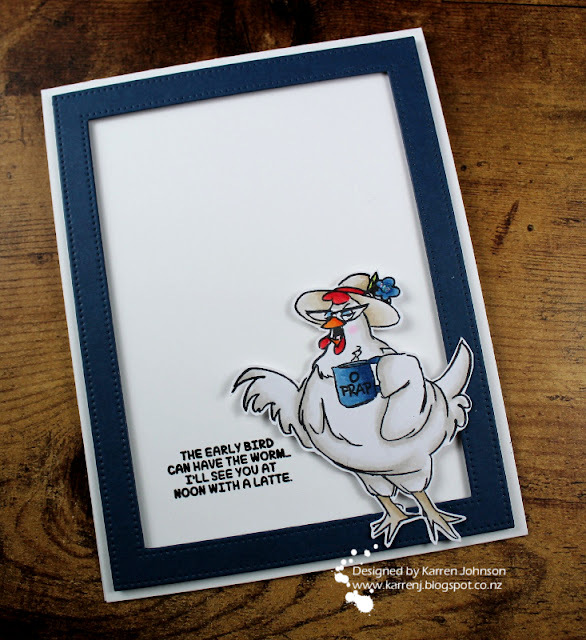 So the other day I had a post featuring a caffeinated chicken. 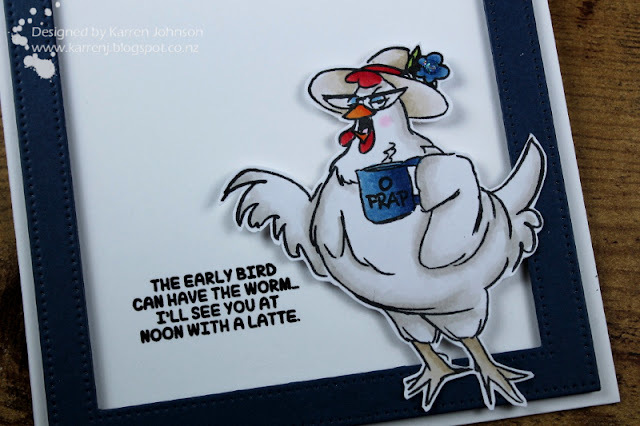 Well, today I have a caffeinated mermaid and this time I am on time for the Coffee Lovers' Bloghop (I was a day early with my chicken card - darned time zones)! I used the sketch from MFT Stamps and the colors from Color Throwdown for my card. 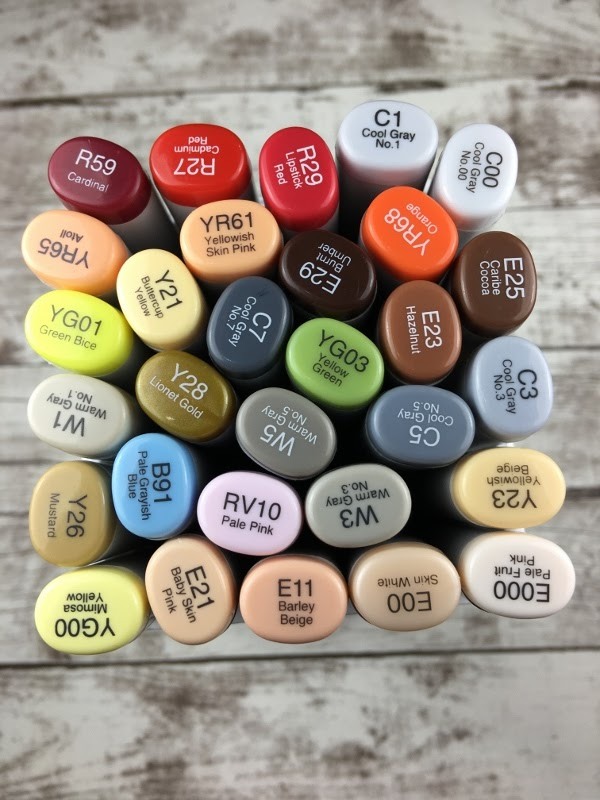 I'm also going to link up to the Make Your Mark challenge at Addicted to Stamps and More and wish them a happy 5th birthday! I'll start by saying that I wasn't going to get this Mermazing set, but then every release I tell myself I'm not going to get the Birdie Brown sets and my resolve lasts maybe a month and then they're in my cart and on their way to my house! 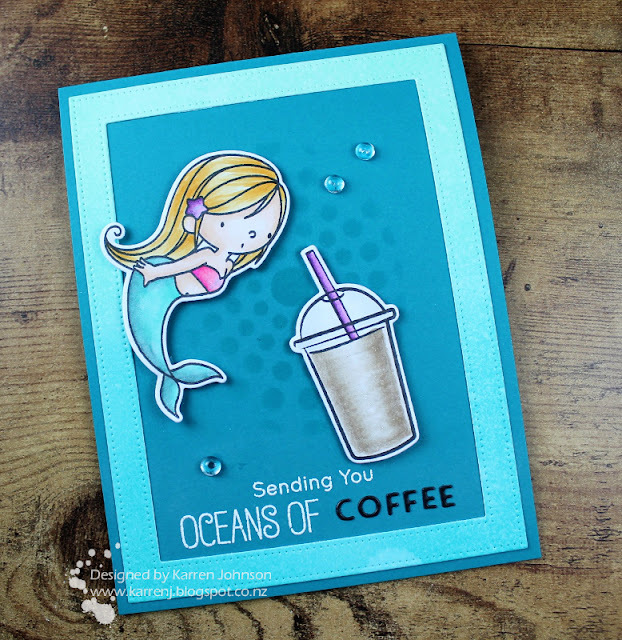 I paired up this adorable mermaid with an iced coffee from Essentials by Ellen set. I thought this particular mermaid looks like she might be bending over a big cup of caffeine so that's how I built my card. 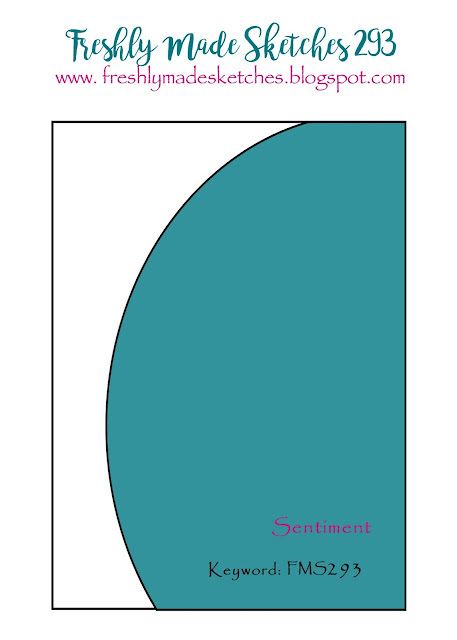 The background is sponged through an oval mask directly onto the Tropical Teal card base. The frame is a panel sponged with Peacock Feathers and Cracked Pistachio then spritzed with a Perfect Pearls mist. I had to do some fairly major surgery on the sentiment to get it to fit. I cut off the word "love" and added a die-cut word "coffee" cut from black cardstock. I also had to cut off the "Sending You" and stamp that separately so I could centre it properly. The mermaid and coffee are popped up on foam tape and I finished with some clear droplets to represent bubbles. The coffee, straw, mermaid tail, top and the starfish are all painted with clear sparkle pen for some shimmer. The patterned paper is from CTMH and a gorgeous bold gold and white stripe. I die-cut the centre with a rectangle die and added another patterned paper in the negative space. 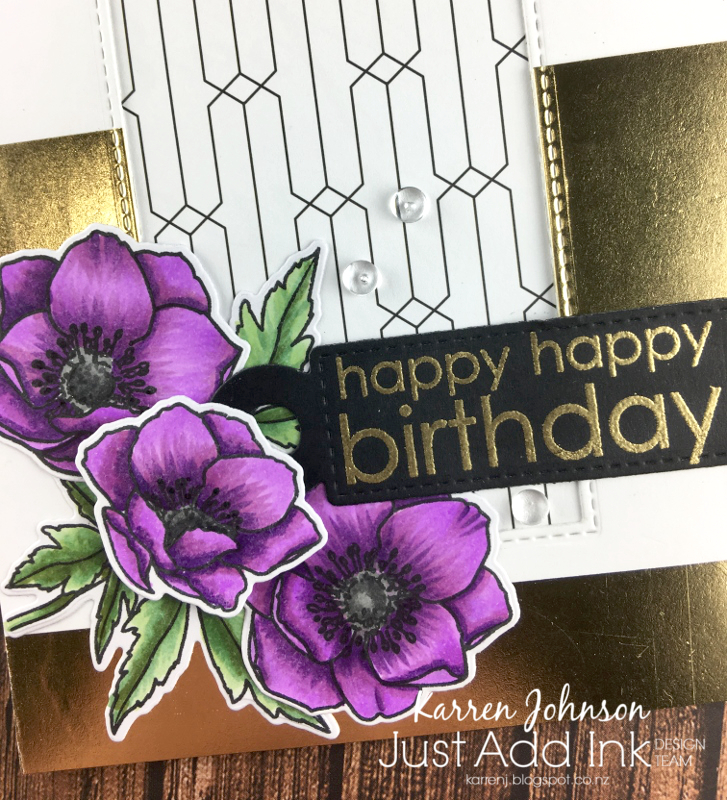 The sentiment was gold-embossed onto a black die-cut tag and the flowers were ones I coloured for fun when I was playing around with a NBUS stamp set by WPlus9. I decided I liked the bold purple colour so used them on a card. Thanks so much for visiting. 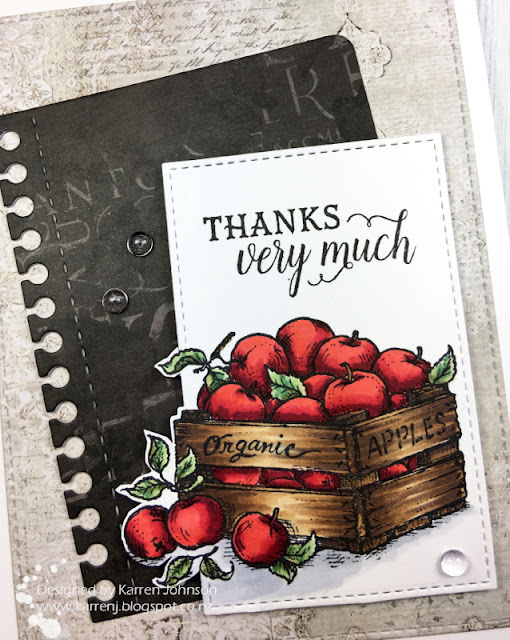 The JAI design team have some gorgeous cards for you using the sketch, so please head on over and check them out. I'm also linking this up to the Anything Goes challenge at The Flower Challenge and the Patterned Paper Challenge at Simon Says Stamp. Welcome! This is the first of two posts today. 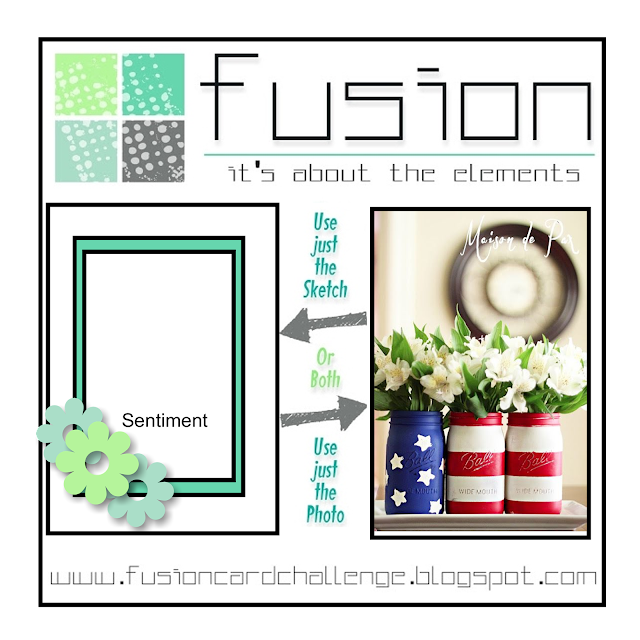 It's time for another Fusion challenge and this time I've gone for a red, white and blue color scheme (or flowers if you prefer) and a fun sketch. I just love this image from Art Impressions and colored this old girl in the challenge colors. The sentiment cracks me up as well. I used a white card base and a navy blue pierced frame popped up on foam. I fussy-cut the chicken and added her with foam too. Unbeknownst to me, when I pulled the stamp off the packaging to use for the first time, I left a bit of her claw behind. Luckily, the sketchy nature of the stamp means it's not too noticeable - in fact I didn't notice until I put the stamp away again and saw the claw still on the packaging! Thanks for dropping by! The rest of the DT have some gorgeous cards using the challenge graphic, so I hope you'll check them out. I'm going to link this up to the animals challenge at CAS on Friday (assuming a chicken is also an animal?) and the CAS feathered friends challenge at Paper Players. Edited to Add: This card got a shout out at Paper Players. Hi and welcome! This week it's my turn to be host at Freshly Made Sketches and I tried to come up with something a bit different from my usual CAS style. The card I made has lots of glitter, so I'm linking it up as my final card for MFT's Camp Create - Glitzy Glitter. As you will see, I didn't exactly get my own sketch right on my card, but the idea is there! The glitter panel is raised up on foam tape. 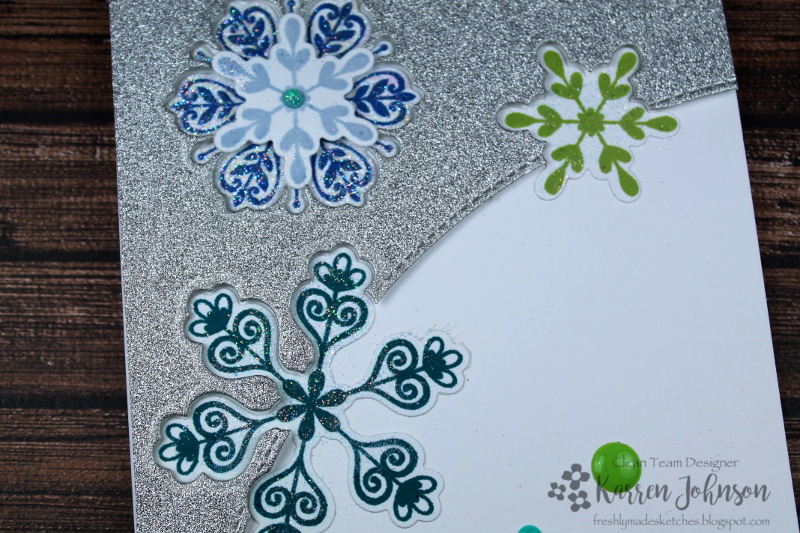 To finish the card, I used silver embossing powder for my sentiment and some Nuvo Crystal Drops to match the ink colors. Thanks so much for visiting and I'm so glad to have earned all the badges from this session of Camp Create! Be sure to head on over to check out the rest of the DT cards - you'll see a great variety and some wonderful interpretations of our sketch. I used the Triangles dies for this card and didn't even snip them apart - jus placed them onto a white panel and run them through the Big Shot with an embossing pad. 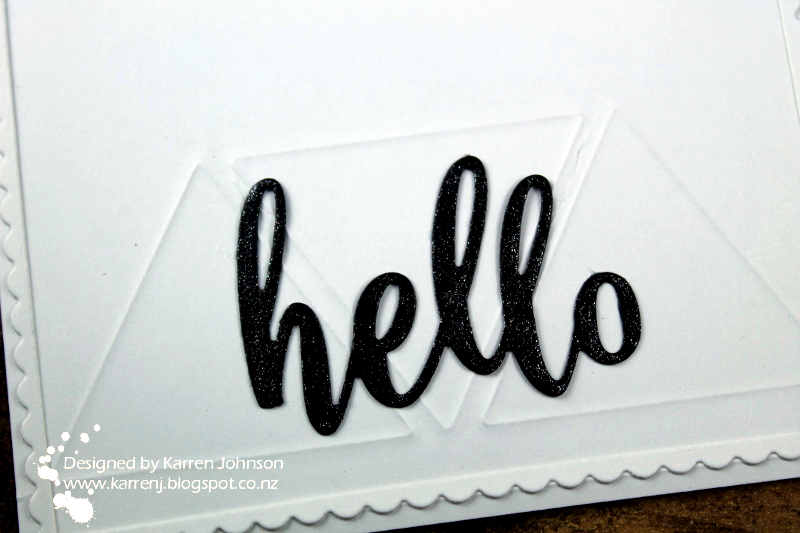 I die-cut a black "hello" and colored it with Spectrum Noir Clear Sparkle Pen before attaching it to the card base across the rectangles. I adhered the panel to a white card base and then wanted to add something more. I finally settled on a white scalloped frame die-cut from a Blueprints set and then cutting the insides out with a rectangle die. I adhered the little scalloped frame to the card base and called it done. Hi! 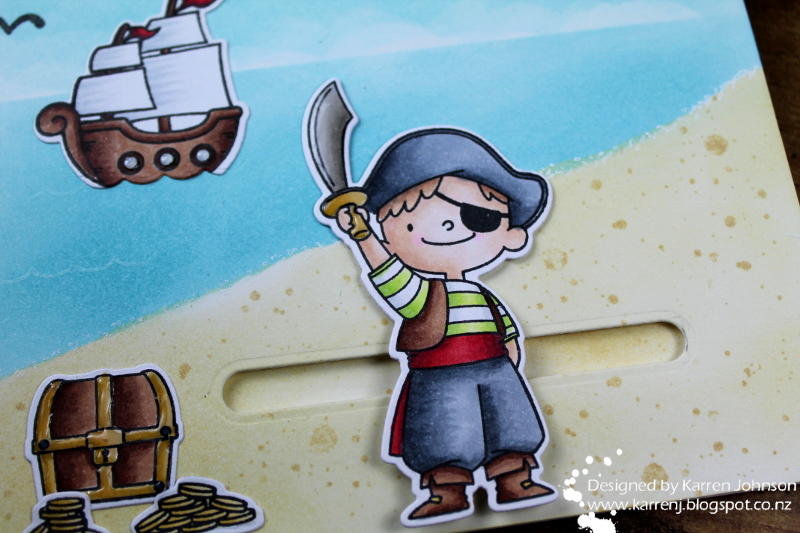 Today's card is for Day 4 of Camp Create - Sensational Sliders! 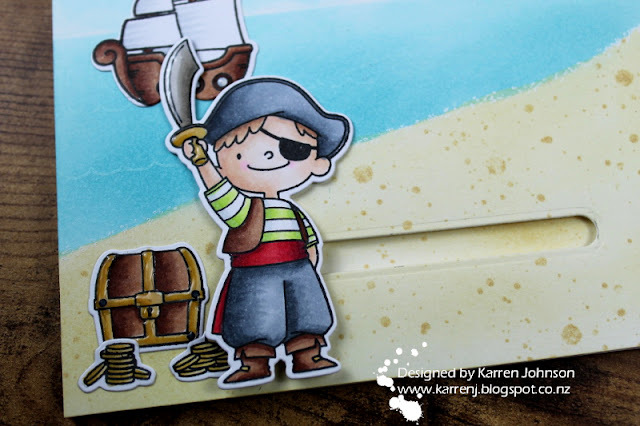 For my card, I used the adorable Party Like a Pirate set and created a beach scene. 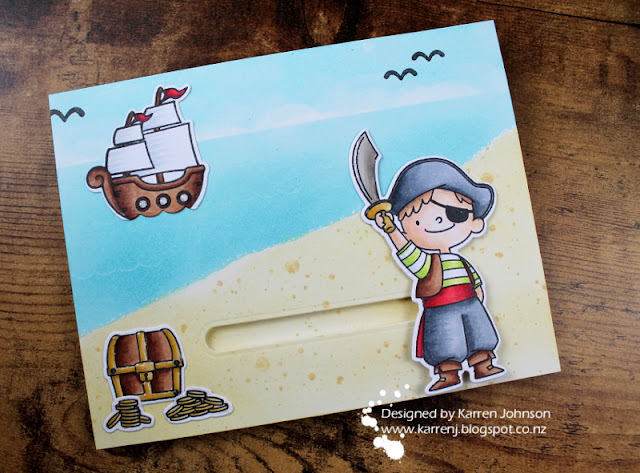 I started by creating the beach scene on a panel of Bristol Smooth cardstock. I created a mask from torn copy paper and sponged Antique Linen at the bottom. I then took the small dot stamp from Distressed Patterns and stamped over the sand to give some texture. I did the same thing to the card base behind where the slider was going to go. I then reversed the mask and also added a straight piece of paper to separate the sea from the sky. The sea was sponged with broken China and the sky with Tumbled Glass. Partway through sponging the sky, I remembered I had the Cloud Stencil so used it but you can hardly see it. I stamped the waves from Otterly Love You in white ink and also used a white gel pen to put dots of "sea foam" between the sand and sea. Finally, I stamped a couple of birds and set the panel aside. I stamped, colored and die-cut various images from the stamp set and then placed them onto the panel so I could decide where to place my slider element. Once I was happy with placement, I die-cut the slider component and placed a slider mechanism behind the beach panel before adhering to the card base using foam tape. It was at this point I realised I had forgotten to die-cut the "waves" so I could slot the ship into the gap, so to fix the problem I die-cut the bottom of the ship with the waves die and you can't tell the difference! All the images were then adhered to the card, and I finished by going over some of the elements with Glossy Accents. Thanks for visiting! 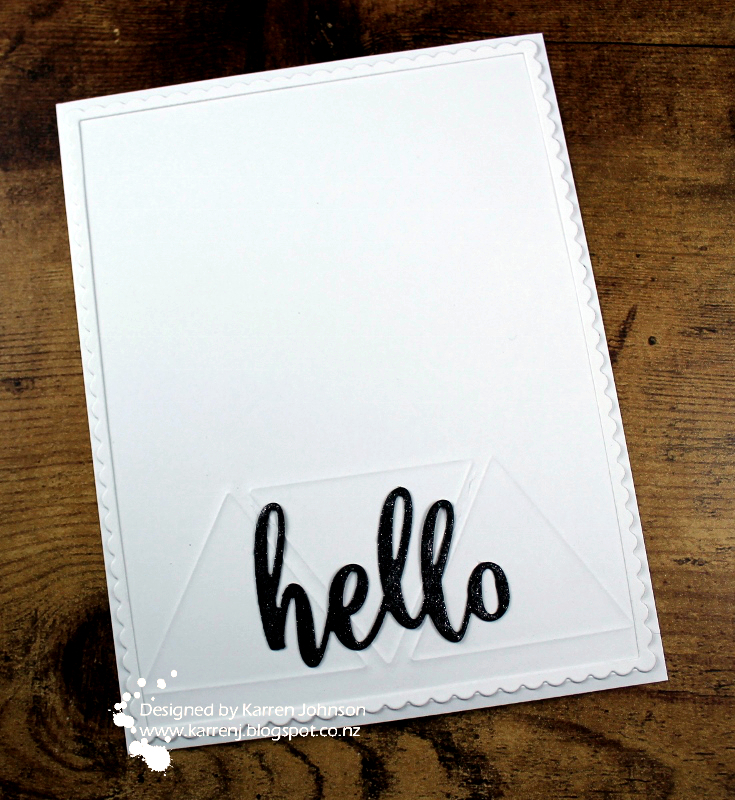 I'm also going to link this up to Sweet Stampin's Creations for Children Challenge. Hi and welcome to my second post today! 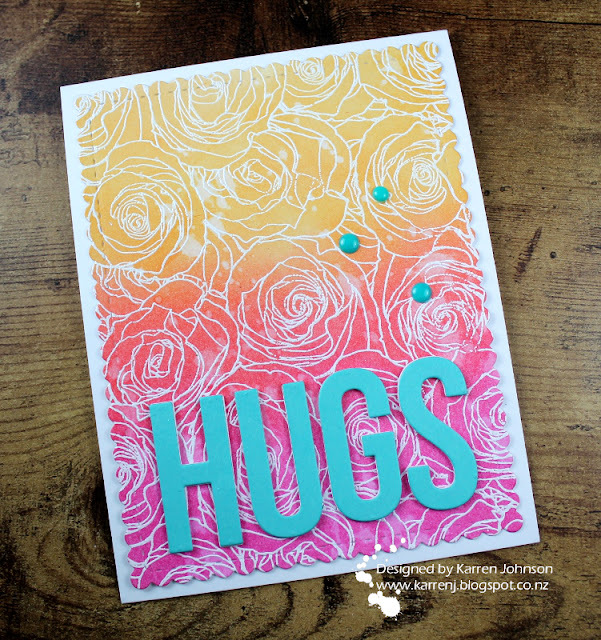 This card is for the Remarkable Resist Camp Create Challenge. 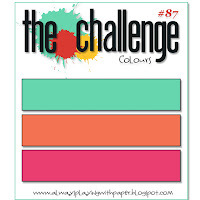 I also used the gorgeous colors from The Challenge. 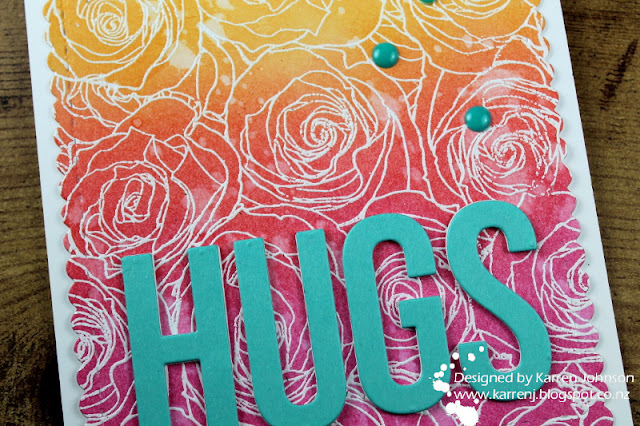 After white-embossing the Roses All Over background stamp onto a panel of Bristol Smooth cardstock, I ink-blended Picked Raspberry, Abandoned Coral and Spiced Marmalade inks over the image. I then flicked on some water (which I later regretted, but what's done is done!) 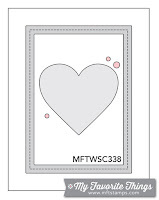 and die-cut the panel with a scalloped edge die. The word "hugs" was die-cut from Audrey Blue and then stacked with 3 layers of white before being adhered to the inked panel and then adhered to a white card base. 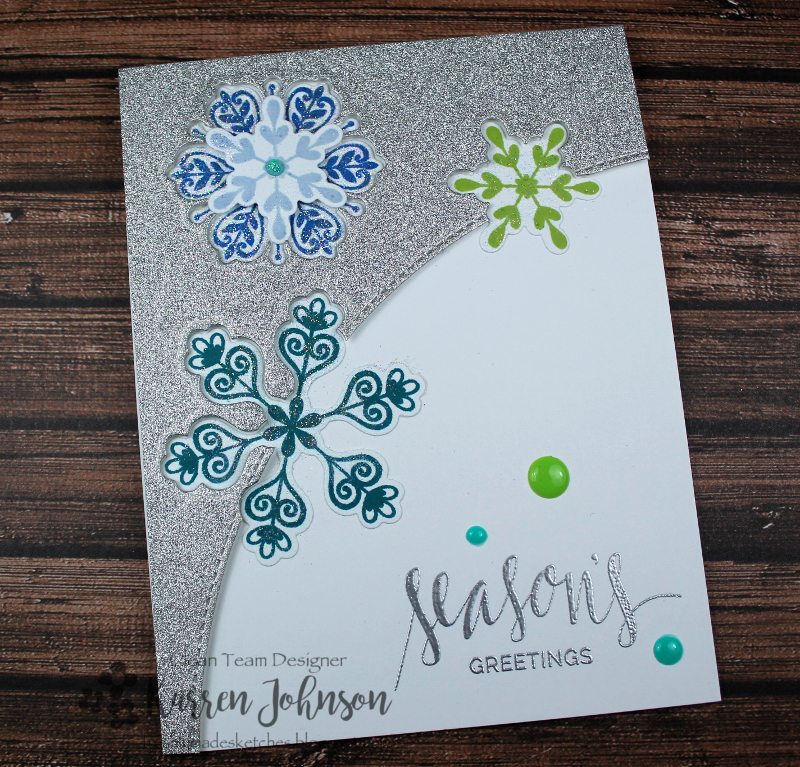 I finished the card with some Nuvo Crystal Drops and colored the die-cut word with Spectrum Noir Clear Sparkle Pen. I'm continuing with my Camp Create cards and this one is for the Spectacular Shakers challenge. I also used the colors from Color Throwdown. Behind my shaker is a sponged panel of Bristol Smooth cardstock using Twisted Citron, Broken China and Chipped Sapphire distress inks. 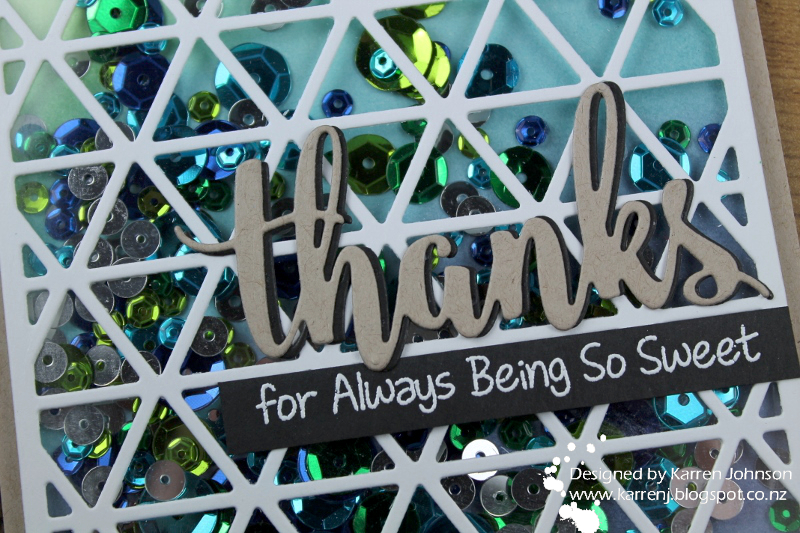 I created the shaker component using the Triangle Screen die cut from white cardstock and some acetate. After adhering foam tape around the outside of the die-cut, I piled in sequins in aqua, dark blue and green plus a few silver as well. I then placed the sponged panel onto the foam tape and carefully cut any excess from around the edges. The whole shaker part was then adhered to a Desert Storm card base. The "thanks" word was die-cut from both Desert Storm and black cardstock and adhered slightly offset to create a shadow. The rest of the sentiment was taken from Sweet Birthday wishes and white-embossed onto black.